For his work with The Who, see The Who discography. The following is the solo discography of British rock musician Pete Townshend. 1986 Deep End Live! 98 Recorded in 1985 with backing band Deep End. 1999 A Benefit For Maryville Academy — Recorded in 1998. 2000 Live: Sadler's Wells — Recorded in 2000, from Townshend's Lifehouse concert series. Live: The Empire — Recorded in 1998. Live: The Fillmore — Recorded in 1996. The Oceanic Concerts (with Raphael Rudd) — Recorded 1979-1980. 2003 Live: Bam 1993 — Recorded in 1993 on Townshend's Psychoderelict tour. 2004 Live: Brixton Academy '85 — Alternate live album taken from the same shows as Deep End Live! 1996 The Best of Pete Townshend — — Features new song "Uneasy Street". Lifehouse Elements — — Sampler of Lifehouse Chronicles. 2001 Jai Baba — — Box set of Happy Birthday, I Am, and With Love. 2002 Scooped — — Compilation featuring excerpts from the Scoop series. 2015 Truancy: The Very Best of Pete Townshend — — Features new songs "Guantanamo Bay" and "How Can I Help You". "Barefootin'" — — — — — — — — — — Deep End Live! 1975 Tommy (soundtrack) Soundtrack to Ken Russell's 1975 film, produced by Townshend & Russell. 2015 Classic Quadrophenia Classical recording orchestrated by Rachel Fuller featuring guest guitar & vocal work by Townshend. Top 100 peaks, except "English Boy": "Official Charts > Pete Townshend". The Official UK Charts Company. Retrieved 23 June 2017. N.B. This site is missing positions 76–100 between 13 April 1991 and 30 January 1994 inclusive. "English Boy": "Chart Runs for: Pete Townshend (from ukmix.org Chart Histories thread, page 176)". Imgur.com. Retrieved 23 June 2017. Top 200 peaks from November 1994 to December 2010: "Chart Log UK 1994–2010 > DJ T – Tzant". zobbel.de. Retrieved 23 June 2017. ^ a b c Australian chart peaks until 19 June 1988: Kent, David (1993). Australian Chart Book 1970–1992 (Illustrated ed.). St. Ives, N.S.W. : Australian Chart Book. p. 312. ISBN 0-646-11917-6. N.B. The Kent Music Report chart was licensed by ARIA between mid-1983 and 19 June 1988. ^ "austriancharts.at > Pete Townshend in der Österreichischen Hitparade" (in German). Hung Medien. Retrieved 23 June 2017. White City: "Pete Townshend – White City (album)" (in German). GfK Entertainment. Retrieved 23 June 2017. The Iron Man: The Musical by Pete Townshend: "Musical / Pete Townshend – The Iron Man (album)" (in German). GfK Entertainment. Retrieved 23 June 2017. ^ a b "dutchcharts.nl > Pete Townshend in Dutch Charts" (in Dutch). Hung Medien. Retrieved 23 June 2017. ^ a b "charts.org.nz > Pete Townshend in New Zealand Charts". Hung Medien. Retrieved 24 June 2017. ^ "norwegiancharts.com > Pete Townshend in Norwegian Charts". Hung Medien. Retrieved 23 June 2017. ^ a b "swedishcharts.com > Pete Townshend in Swedish Charts". Hung Medien. Retrieved 23 June 2017. ^ a b "hitparade.ch > Pete Townshend in der Schweizer Hitparade" (in German). Hung Medien. Retrieved 23 June 2017. All peaks other than stated: "Billboard > Artists / Pete Townshend > Chart History > Billboard 200". Billboard. Retrieved 23 June 2017. N.B. This page is missing peaks for Rough Mix, White City: A Novel, Deep End Live! and Another Scoop. Peaks for Rough Mix, White City: A Novel, Deep End Live! 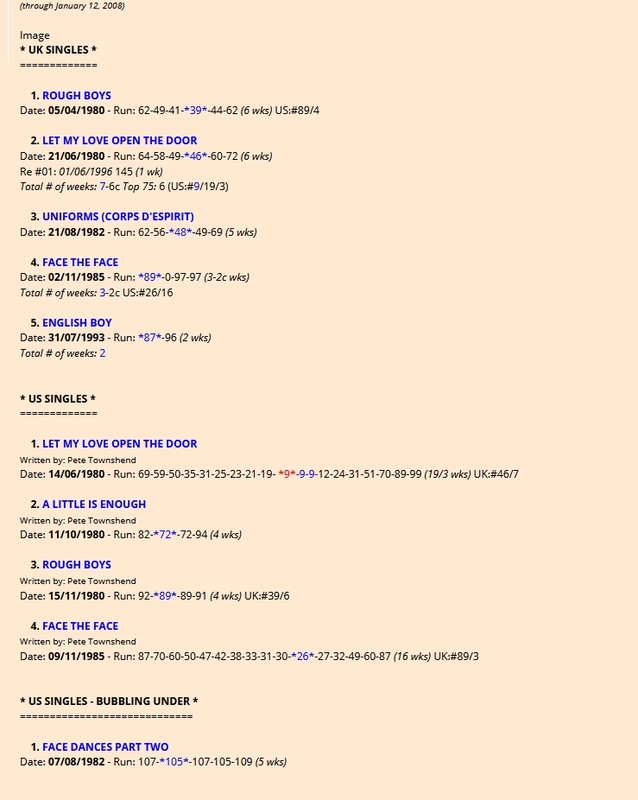 and Another Scoop: "US Albums (from ukmix.org Chart Histories thread, page 176)". Imgur.com. Retrieved 23 June 2017. ^ a b "Gold & Platinum: Pete Townshend". Recording Industry Association of America. Retrieved 1 November 2012. ^ "Ultratop > Pete Townsend in Ultratop Vlaanderen" (in Dutch). Hung Medien. Retrieved 24 June 2017. "Face the Face": "Pete Townshend – Face the Face (single)" (in German). GfK Entertainment. Retrieved 23 June 2017. "Give Blood": "Pete Townshend – Give Blood (single)" (in German). GfK Entertainment. Retrieved 23 June 2017. Hot 100 peaks, other than "Face the Face": "Billboard > Artists / Pete Townshend > Chart History > The Hot 100". Billboard. Retrieved 23 June 2017. N.B. This page is missing the peak for "Face the Face". Bubbling Under peaks and "Face the Face": "Chart Runs for: Pete Townshend (from ukmix.org Chart Histories thread, page 176)". Imgur.com. Retrieved 23 June 2017. ^ "Various - The Who's Tommy (Original Cast Recording)". Discogs. Retrieved 7 March 2019. ^ "The Royal Philharmonic Orchestra Conducted By Robert Ziegler - Pete Townshend's Classic Quadrophenia". Discogs. Retrieved 7 March 2019. This page was last edited on 7 March 2019, at 11:26 (UTC).